I'm the person who pins you in a corner to talk about politics. Thinking about grassroots and/or donor support. With the wonderful victories for progressive women in the 2017 Georgia elections, I’m struck by how large a role grassroots support played in those successes. Beyond the amazing efforts of individuals working for candidates, there’s another group to consider: donors. We’ve all heard of Emily’s List: they identify and raise money for progressive women candidates. Their name is an acronym – Early Money Is Like Yeast. Campaign contributions early in the election cycle provide the money to produce campaign materials and events. They also establish credibility for the candidate, which encourages potential donors to get onboard. Each donor’s network broadens the candidate’s pool of contributors. Friend-to-friend, colleague-to-colleague: the ripples of support give candidates the resources they need to reach the voters. It is never too early to learn a candidate’s positions, values, plans; and it is never too early to throw in some yeast for a candidate you believe in. 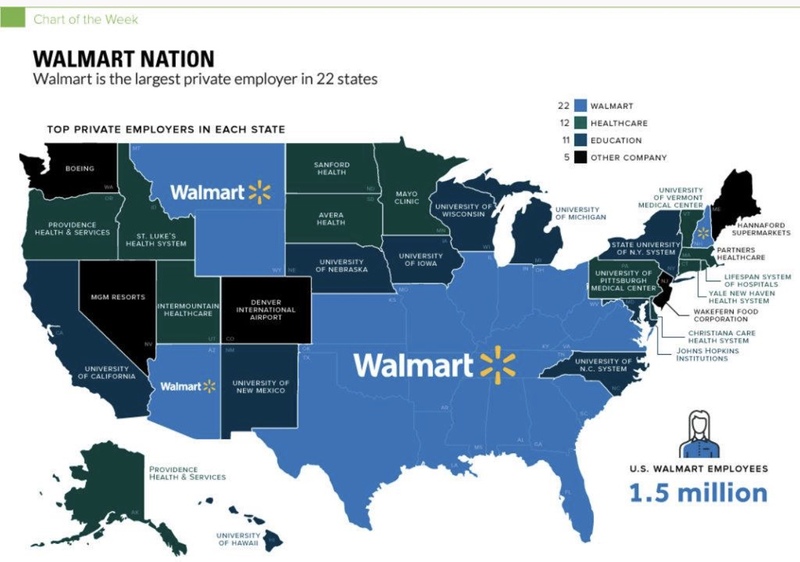 In 45 states, the largest private employer is either Walmart, a university, or a medical services system. In 13 states, the largest employer is a medical services provider. Let’s say there are (just guessing) 1,000 or so top healthcare executives able to direct political contributions via PACs and “research” by industry-funded organizations. This confirms why Members of Congress are eager to gut healthcare (Affordable Care Act, Medicare, Medicaid) for consumers in order to fatten profits for the medical services industry. If the non-C/Suite employees of those medical services corporations joined with consumers to demand State Legislatures and Congress expand, not limit, access to healthcare, maybe the millions of voices/votes would override the millions of dollars of campaign contributions. Maybe. But only if the reality of votes overwhelmed the reality of dollars. How many employees – in any industry – belong to unions? How many unions are effective in expanding membership and public respect, lobbying Congress, and endorsing progressive, pro-labor candidates? Could unions AGAIN be instrumental in rectifying income inequality? Could they become powerful in increasing employment by freeing up money for capital improvements and wages (by highlighting excessive executive compensation and through pro-labor tax incentives) and decreasing incentives for off-shoring? Could unions influence state and federal lawmakers to not just permit but to encourage workers to bargain collectively to restrict work-practices that allow corporations to make more profit for the bosses and shareholders at the expense of employees’ quality of life? Maybe. But only if unions believe they are relevant, and act accordingly. Could union members, union organizers, union lobbyists raise up the voices of the majority so that the volume of dissatisfaction with the injustices of Corporate America drowns out the promises of election victories and government sinecures? Yes, unions can do this. We did it before – in an even more repressive and punitive era. We can do it again. And there is no better day than today to begin. I had just arrived at work today when a colleague asked me, “Aren’t you sick of politics?” I made a polite response, something about being tired of the meaningless wrangling, lying, and general bad manners, but no, I’m not tired of the process of trying to identify – and then elect – folks who have the welfare of the people – all the people – at heart. I’m encouraged that Americans do seem to be paying attention to the current, unsettled state of the relationship between citizens and our government. And it is very unsettled. We have the ironclad partisanship of Obama and Romney supporters, with the full-throated baying about 47%, birth records, religion, race, the economy, Libya … and whatever the 24/7 news cycle has spun up for us to fear today. More damaging even than that, I think, is the well-deserved opinion we hold about the gridlocked Congress, those representatives who are more directly responsible for the state of our nation and its individual States than the President. The Gallup organization reported at the end of last year that a new record-low 11% of Americans approve of the job Congress is doing, the lowest single rating in Gallup’s history of asking this question since 1974. Based on the Gallup numbers and my personal email traffic, it sounds as if we may be ready to change something fundamental about the way we allow our Senators and Congressmen/women to serve us. Here is the emailed text of the Congressional Reform Act of 2012. Congress (past, present & future) participates in Social Security. All funds in the Congressional retirement fund move to the Social Security system immediately. All future funds flow into the Social Security system, and Congress participates with the American people. It may not be used for any other purpose. All contracts with past and present Congressmen/women are void effective 12/1/12. The American people did not make this contract with Congressmen/women. “The 26th amendment (granting the right to vote for 18 year-olds) took only three months and eight days to be ratified! Why? Simple! The people demanded it. That was in 1971 – before computers, e-mail, cell phones, etc. Of the 27 amendments to the Constitution, seven took one year or less to become the law of the land – all because of public pressure. Does the Congressional Reform Act of 2012 (or the 28th Amendment) look like the solution? Not exactly, but it’s a good-enough place to start talking about fixing our broken legislative process. By the way, Amendments either originate in the States (in an Article V Convention) or by a vote by two-thirds of each house of Congress. Congress will only call for an amendment-proposing convention, “on the application of the Legislatures of two-thirds of the several States.” That means 34 State legislatures would have to submit applications. Once an Article V Convention has proposed an amendment, then the amendment has to be ratified by three-fourths of the States (i.e., 38 States) in order to become part of the Constitution. And if effectively having to get Congress’ permission to propose an amendment didn’t make it even more challenging to rein in Congressional perks, Congress also has the power to choose between two methods of ratification: ratification by the State legislatures, or ratification by State conventions called for that purpose. Finally, all 27 amendments to the Constitution have happened in a procedural sense by going through Congress and not through proposal by State legislatures. So … I’m going to forward the email, but I’m not holding my breath waiting for a national body of citizen legislators.